Samson's MediaOne M30 Powered Studio Monitors are a compact, full-range speaker solution for all your desktop and multimedia applications. Whether you're listening to music, producing tracks, watching videos or gaming, this stereo monitor pair features an internal amplifier, solid wood construction and high-quality components that produce big sound, while occupying minimal desktop space. Don't let their small size fool you. 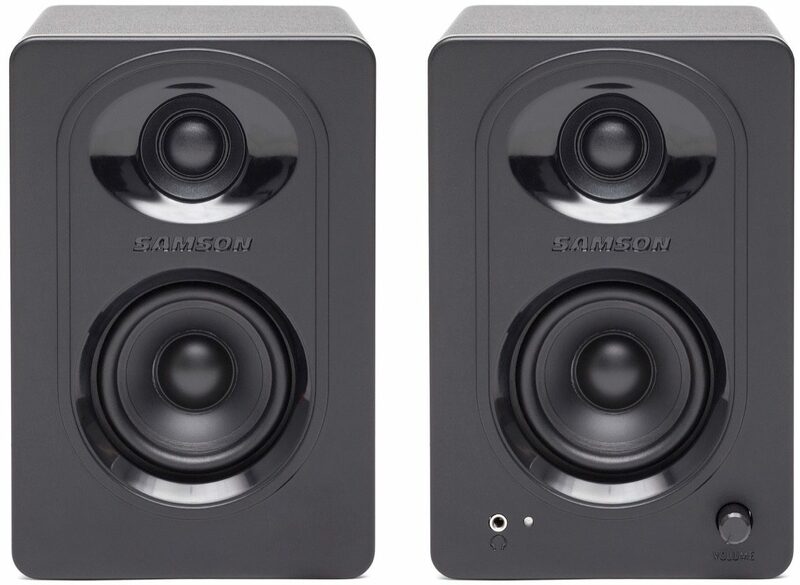 Both MediaOne M30 monitors feature a 3" polyproylene woofer that provides tight lows, complemented by a 3/4" silk-dome tweeter housed in a custom waveguide that adds smooth highs with a wide sound stage. 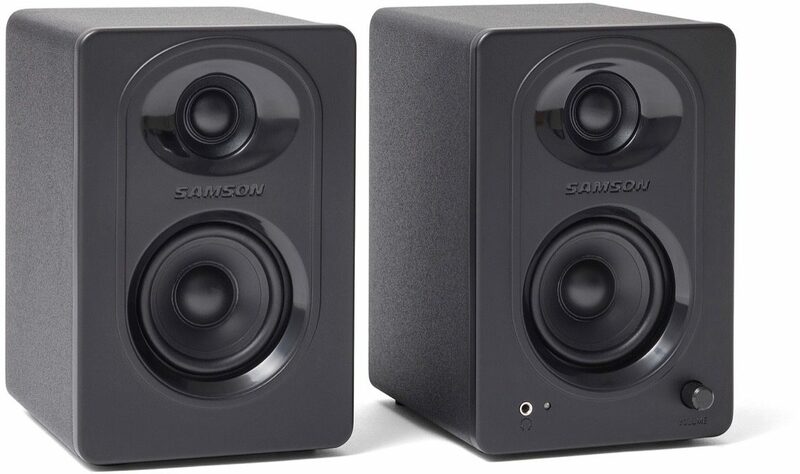 The result is a compact system with a balanced frequency response and stunning full-range audio. On top of that, a Bass Boost switch allows you to enhance the lows if desired. 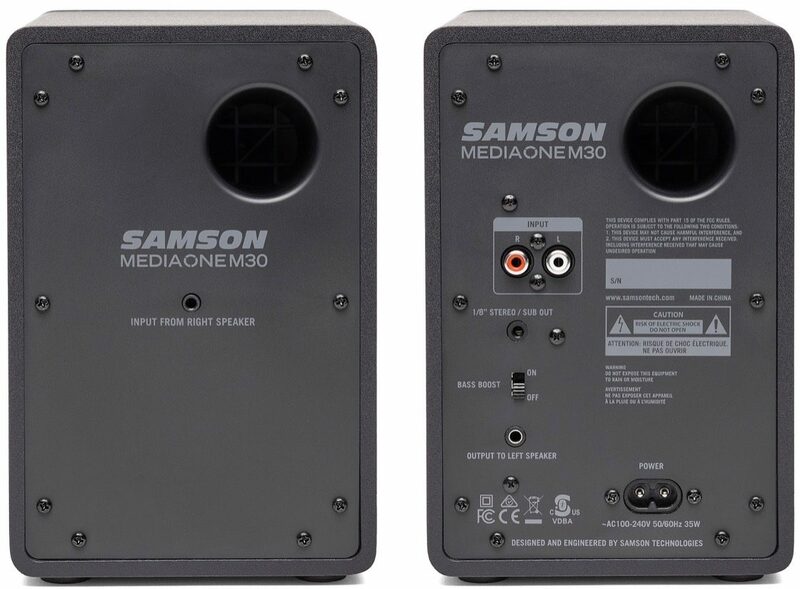 Based on Samson's 20 years of experience designing professional studio monitors for recording studios around the world, the MediaOne M30s are powered by an internal 20-watt (10 watts per channel), studio-grade A/B amplifier to produce robust, detailed sound. Also, solid wood cabinet construction with rear porting ensures maximum efficiency and low response without mechanical power loss. Connect your mixer, audio interface, computer or mobile audio device to the system's rear RCA inputs. A front panel headphone jack mutes the speakers for private listening sessions. In addition, a 1/8" (3.5mm) output allows you to integrate a powered subwoofer with your MediaOne M30s to create a 2.1 system. zZounds is an authorized dealer of Samson products.